Scientific Name(s): Gyromitra esculenta (Pers.) Fr. Photographer(s) Appreciation: Another round of thanks to PietervH@Flickr for contributing one of his excellent fungus photographs! Gyromitra esculenta, via the Botany Photo of the Day Flickr Pool. What do rocket fuel and this fungus have in common? No, it has nothing to do with the third line in the lyrics of Elton John’s and Bernie Taupin’s Rocket Man. Eight to ten species of Gyromitra exist on the North American continent and about two or three in Europe. 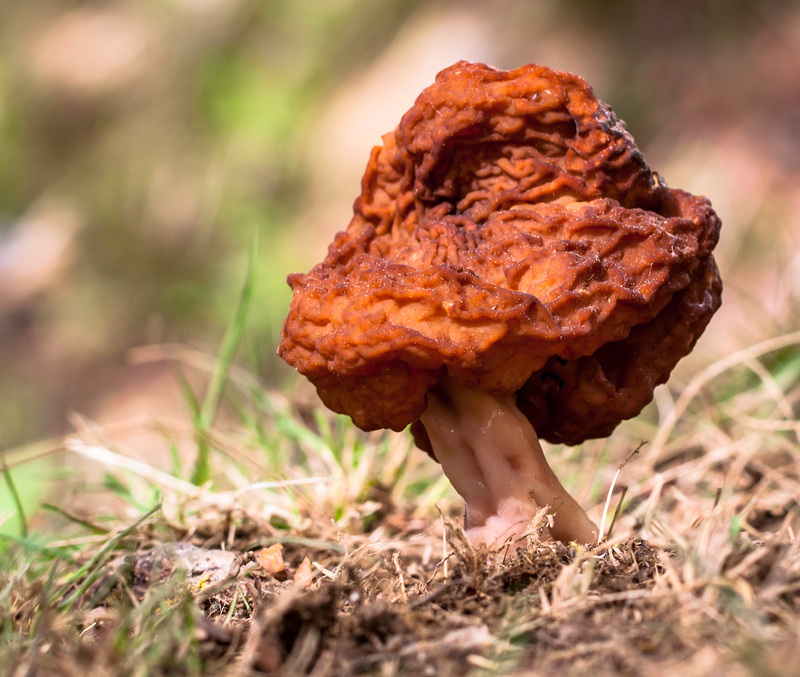 Although they are much sought after in Europe as an edible species (Gyromitra esculenta), 2 to 4 per cent of all mushroom fatalities are associated with them. It is not clear whether the same species occurs in North America, although we call one species here by that name. The active ingredient is called gyromitrin (N-methyl-N-formylhydrazine), which is metabolized to monomethylhydrazine (rocket fuel!) in the body. Eaten raw, most of the Gyromitra spp. are quite poisonous. In an attempt to prevent poisoning caused by ingesting the mushrooms, they are usually parboiled to evaporate the gyromitrin, which gives off a chocolaty odor. The process is usually repeated twice, with the water being discarded each time. However, the volatile chemical can be inhaled through the nose, and enough can be left in the mushrooms to cause illness when eaten. So just standing near the boiling pot of mushrooms can cause problems, and there is still the possibility of poisoning by ingestion. It is absolutely worth reading Tom’s page about Gyromitra if you are considering eating these, but I’ll summarize: there is some taxonomic doubt as to whether the Gyromitra esculenta of North America (or all of North America) is the same species as in Europe. There is also apparently variation among populations of Gyromitra esculenta in North America in terms of toxicity, which is seemingly the case for other species of Gyromitra as well. Tom’s conclusion is that these have a significant amount of risk, if being consumed. Weird and Wonderful Wild Mushrooms has a write-up about Gyromitra esculenta and Gyromitra gigas: Two False Morels. Two other excellent resources (as always) are Mykoweb: Gyromitra esculenta and Michael Kuo’s MushroomExpert.com: Gyromitra esculenta. My first reaction was yuck I wouldn’t eat that. But if you look at the image the stem looks almost porcelain. It is rather pretty. The fungi Photos of the Day are the best! So many interesting stories. The video of Tom talking about his replacement heart – not new any more – is touching. His name is familiar with anyone who does online looking for Mushroom ID’s. That two of his medications are derived from fungi is another connection here, but what wasn’t covered is the profound and encouraging results from some of the more controversial mushrooms. Studies under very controlled conditions are providing new promises of help for people with various hard to treat diseases such as PTSD and Depression. Great photo so thanks for bringing it to us. Thank you Daniel for the interesting write-up, I’ll be certain to watch the TEDx by Dr. Volk. PietervH’s photo is outstanding. With the drought in southeastern Colorado, I’ve not seen a morel for years.